After writing The Federal Tax Law of Conservation Easements and three Preserving Family Lands books, Steve’s latest book ventures into new waters with a new agenda for the “business of open space” in the coming decade and after that. Based on his decades of work on private land protection transactions, Steve sees the need for the “business” to develop new ideas, new techniques, new transactions, and to reach out to more landowners. 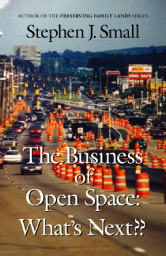 If you are interested in seeing the business of open space move forward, you MUST read this new book and you must encourage your colleagues to do the same. Steve wrote the original Preserving Family Lands twenty-five years ago as a “primer” about conservation easements and the related tax issues for landowners, their advisors, and land trusts; this new book moves the business in dramatic and necessary new directions. c/o Law Office of Stephen J. Small, Esq. © 2019 Steve Small. All Rights Reserved.